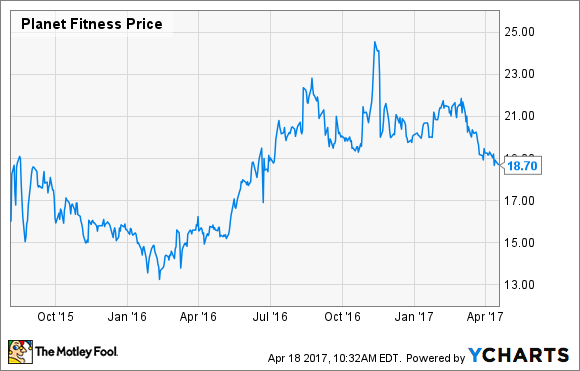 Is It Time to Buy Planet Fitness? Is the fast-growing gym's stock headed higher, or is time to sound the lunk alarm? Planet Fitness (NYSE:PLNT) has been quickly growing. Not only have new locations been cutting ribbon, but typical New Year's resolutions aimed at exercising and getting in shape have propelled total memberships higher as well. Still, the company's stock has declined 15% in the last few months and is down 25% from its peak last fall. Here's a look into what's going on -- and whether it's time to buy the stock or not. In 2016, Planet Fitness' total revenue increased 14% to $378 million. That was achieved through 195 new openings, a 17% location count increase, and 8.8% growth in same-store sales. At year-end, the gym was knocking on the door of 9 million in total memberships and it recently reported that it surpassed the 10 million members mark. The company's claim to fame is its low-membership cost (starting at $10 a month) and non-intimidating environment. Lifters who get a little too into their workout are threatened to tone it down with the prominently featured "lunk alarm," which sounds off if you start disturbing or intimidating other guests. The company also talks up a no-bullying and judgement-free atmosphere. The message is paying off with the target audience. The company reports 43% of new signups came from people who said they have never had a gym membership before. Reasons given for not joining until now? Survey says expensive fees and an intimidating environment kept them away. That incremental growth at existing locations especially helped the bottom line during the year. Net income per share rose to $0.50, a better than 350% increase over 2015. And if that wasn't good enough, Planet Fitness showed off further when it paid out a $2.78 special dividend to shareholders in December. The system in place for growth is working, so Planet Fitness plans to keep rolling with it. Most locations operate under a franchise agreement, where a franchisee takes care of basic operations. Under Planet Fitness' new franchise model, the company gets a 5% cut of revenue generated in addition to equipment sales and fees for setting up the equipment. The franchise model was the biggest driver of revenue last year, so the 2017 plan is for 190 to 200 more locations. Paired with an expected 6% to 8% rise in comparable sales, Planet Fitness sees sales rising this year to between $405 and $415 million. That would be a 7% increase at the low end of guidance. Supporting those new store openings is the current retail climate. The internet has disrupted brick-and-mortar stores, causing many to close, leaving quite a few vacancies on the market. The "one person's pain is another's gain" mantra is holding true, though. Without revenue coming in, strip mall owners are ready to make a deal, and Planet Fitness reports being able to negotiate very favorable terms as it expands. Cheap reps or pumping iron? Planet Fitness' low-pressure and supportive gym atmosphere have helped foster a very different kind of attitude from Wall Street, though. As revenues and profits improved throughout the last year, performance expectations have gone up as well. One-year trailing earnings and forward price-to-earnings currently sit at 38 and 21, respectively, already pricing in a fair amount of future growth. Expectations may be high, but the company looks well-positioned to deliver results. My favorite measure in judging a company's investment worthiness is free cash flow, or money left over after basic expenses are paid for. 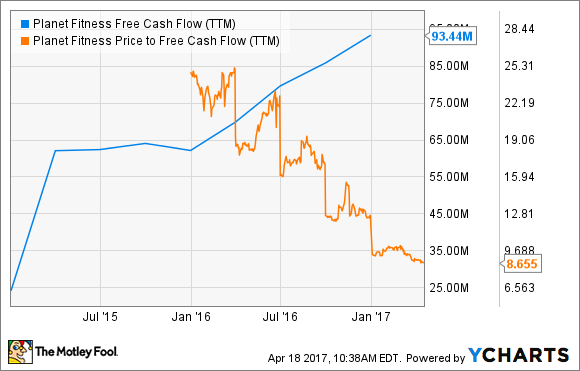 Extra cash on hand continues to rise, and with the recent pullback in the stock, the share price to free cash flow ratio is at a low point. The hype pushing new gym-goers to their local Planet Fitness hasn't translated over to stock performance as of late, but that could soon change. With more locations opening this year and a track record of filling them up, this stock is worth a look.